For a list of the names for each badge in other languages, see here. Badges are items used in several Mario role-playing games ever since their first appearance in Paper Mario, and have appeared in every RPG since except Paper Mario: Sticker Star, Paper Mario: Color Splash, and Mario & Luigi: Paper Jam. They are equipped onto the player and they have a variety of uses depending on the game. They may increase stats, provide unusual abilities, or give characters access to new moves. Each badge requires a certain amount of BP to be equipped, which means that Mario cannot equip all the badges at the same time. The more useful a badge, the more BP it requires. Instead of changing Mario's stats, badges have many uses, from prolonging Mario's Spin Dash to changing the sound effects of Mario's hammer and jump attacks. Some badges also allow Mario to use special attacks with the hammer and shoes that use FP. In Paper Mario badges can be found scattered in all the Mushroom Kingdom, but some particular badges can be only bought from Rowf in Toad Town and from Merlow in exchange for Star Pieces. In the prologue, Goompa gives Mario the Power Jump badge and teaches him how to use badges. Later in the game, Merluvlee in the Shooting Star Summit can predict the locations of badges. There are 80 badges in total, and aside from the pause menu, Mario can also read from the board in his house how many badges he has collected. The HP Plus and Power Plus badges in Paper Mario: The Thousand-Year Door. In Paper Mario: The Thousand-Year Door, as well as being scattered over the world, badges can also be dropped by enemies, bought from the Lovely Howz of Badges and Charlieton in Rogueport with coins, from Pianta Parlor in Rogueport with Pianta Tokens, and exchanged from Dazzle in Rogueport Sewers with Star Pieces. Ms. Mowz can steal badges from enemies and enemies also occasionally drop badges when defeated. In this game, some badges have a "P" at the end of their names, they are identical to their non-"P" counterparts but affect Mario's partner instead. Equipping more than one of the same badge doubles the FP cost of the move for each extra badge equipped. Equipping more than one of the same attack badge increases the attack's power by 1 and/or increases the duration of the applied status effect by 1. Equipping multiple Charge badges gives Mario (or his partner) 1 extra power when charging. When both the W Emblem and L Emblem are equipped, Mario's clothes will change into Waluigi's clothes. There are 85 kinds of badges in total. Interestingly, enemies cannot drop Badges until after Professor Frankly has given Mario the Power Smash Badge. The HP Plus and Power Plus badges in Super Paper Mario. Super Paper Mario eliminated the use of badges, as there was no RPG-style battling system. There are, however, two items that were badges in the past games: Power Plus and HP Plus. They retain their main purposes: Power Plus boosts the character's attack power by one, and HP Plus boosts the character's maximum Heart Points by five. Unlike the badges seen in the first two Paper Mario games, the effects of these items in Super Paper Mario are permanent. The Happy Flower, albeit distinctly different from its badge form, also appears in Super Paper Mario as an item. The player can also buy them both from the Flipside Arcade, but both are extremely expensive, costing 2500 coins each. In Mario & Luigi: Superstar Saga, each bro can only wear one badge at a time. Badges are used to raise Mario or Luigi's Attack stat or their Bros. Points. Certain badges also allow different effects to be used in battle, such as defense from spiked enemies, HP recovery, and attacks with different effects, among others. In the game, badges can be bought in shops all around the Beanbean Kingdom or dropped from defeated enemies. In Mario & Luigi: Partners in Time, Badges only give special effects to Mario, Luigi, Baby Mario, and Baby Luigi. Clothing instead increases and decreases all the stats in this game. 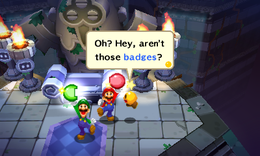 Badges can be found all around the Mushroom Kingdom of the past, dropped by enemies, in the present Kingdom's Item Shop, or bought from Fawful. Like the game's predecessor, only one badge can be given to each bro at a time. Items known as Bros. Badges appear in Mario & Luigi: Bowser's Inside Story, in which they are used in battle by Mario and Luigi (but not Bowser). The first two badges are given to the player by Princess Lipid in the Flab Zone. When a gauge fills up, touching the two linked badges with the stylus activates the badge, yielding a variety of results, such as restoring health. The gauge is filled up by performing an attack in either a "GOOD", "GREAT" or "EXCELLENT" way (the requirements vary from badge to badge). Switching a badge during a battle will reset the gauge to zero. Some badges can be purchased at a shop in Toad Town and others can be found throughout the game. Luigi's badge (the left side of the gauge) determines how good the action command must be to fill the bar, and how big the effect will be. Mario's badge (the right side of the gauge) decides what the effect will be. In Mario & Luigi: Bowser's Inside Story + Bowser Jr.'s Journey, the Badges return, though the Badge system is similar to the one in Mario & Luigi: Dream Team. Mushroom Badge - N/A Obtained from Princess Lipid Restores HP. Bonus Badge - 500 Bought from Toad Town's Badge Shop Increases amount of EXP and/or Coins brothers get in the battle it was used. Bro Badge - 800 Bought from Toad Town's Badge Shop after getting Wisdurm's Star Cure Restores BP. Powerful Badge - 1500 Bought from Toad Town's Badge Shop Increases both brothers' POW. Miracle Badge - N/A Grand Prize in Cholesteroad Deals an amount of damage to all enemies. Certain enemies may take more damage depending on their type. Has a chance to inflicting a status effect on enemies. Shield Badge - N/A Grand Prize in Mushroom Ball Derby Reduces/blocks the damage received from enemies. Beginner Badge - N/A Obtained from Princess Lipid Depends on what badge it is typed with. Restores 20% of HP for both bros. POW up 20% for three turns. Gives you twice as many coins at the end of the battle when equipped. Restores 20% of BP for both bros. Deals a small amount of damage to all enemies. Flying enemies take more damage than others. Reduces damage received from enemy attacks to 50% for two turns. Restores 20% of HP for both bros.
KO activated! Your next attack will be three times as powerful! Will cause defeated enemies to drop an item for three turns. Restores 40% of BP for both bros. Deals damage to all enemies and has a chance of inflicting BURN status. Reduces damage received from enemy attacks to 70% for four turns. Restores 70% of HP for both bros.
Cures any status effects and revives KO'd bros.
POW up 30% for four turns. Gives you twice as much EXP at the end of a battle when equipped. Restores 60% of BP for both bros. Deals damage to all enemies and has a chance of inflicting DIZZY status. Blocks an enemy attack with a barrier five times. Restores 100% of HP for both bros, even when KO'd. KO activated! Your next attack will be six times as powerful! Will cause defeated enemies to drop rare items when defeated for three turns. Restores 80% of BP for both bros. Deals a good amount of damage to all enemies and has a chance of inflicting a random status effect. Prevents being KO'd regardless of how much HP you lose and blocks all status effects for three turns. The Badge Meter in Mario & Luigi: Dream Team. Badges also reappear in Mario & Luigi: Dream Team. The first two badges, the Starter and Mush Badge, are both found in the depths of Pi'illo Castle. Both Mario and Luigi can equip one badge out of the 12 badges making 36 combinations. During battle, a Badge Meter on the bottom screen will fill up as the Mario Bros. attack successfully. When the two badges meet at any point on the meter, one of the two (three/four if the Badge Stock +1 Rank-Up Bonus is selected for one of/both the bros) circles on the bottom screen will show an icon. Touching the icon will do an action depending on what two badges are combined. If all circles on the bottom screen show an icon, and two badges meet, the last icon shown will be replaced. In the chart below, Mario's badges are listed across and Luigi's are listed downwards. Mush Badge Restores 30% of each bro's HP. Restores 50% of each bro's HP. Restores 80% of each bro's HP, revives fallen bros and cures bad status effects. Restores 30% of each bro's BP. Restores 50% of each bro's BP. Restores 80% of each bro's BP. Strike Badge Hits one enemy for 30 damage. Hits one enemy for 80 damage. Hits one enemy for 160 damage. Hits all enemies for 20 damage. Hits all enemies for 50 damage. Hits all enemies for 100 damage. Guard Badge Forms a barrier that reduces damage to zero for 3 attacks. Forms a barrier that reduces damage to zero for 6 attacks. For 3 turns, prevents HP from hitting zero, making the zero impossible to KO. Temporarily increases DEF and reduces damage dealt by enemies. Increases how much the Badge Meter charges during battle. Temporarily increases POW, letting users deal more damage to foes. Virus Badge Temporarily decreases enemies' POW, making them deal less damage. Temporarily decreases enemies' DEF making them take more damage. Makes all enemies dizzy. (Does not work on some foes.) Removes all status effects from all enemies. Might turn any foe into a Mushroom of a type depending on their coin count. Temporarily increases the chance of Lucky Hits. Risk Badge Either fully recovers Mario's and Luigi's HP or drops them to 1. Either fully charges the Badge Meter or resets it. Gives everyone a 50% chance of taking enough damage to drop to 0 HP. Gives everyone a random status effect. Temporarily increases everyone's POW, upping damage dealt and received. Damages everyone. Miracle Badge Produces more coins from enemies. (+30% coins) Produces more EXP from enemies. (+30% EXP) Copies and stores a random Badge effect. Temporarily increases the chances of Lucky Hits. Reverts user's status to the prior turn. Returns used items, cancelling effects. (Note: The in-game description is incorrect— the users' status is actually reset to how it was at the start of the battle.) Stops time for a moment so that all enemies will be unable to move. This page was last edited on March 14, 2019, at 16:03.